Something truly magical happens to Fuller’s Vintage Ales over time. A long, slow maturation darkens the colour and deepens the flavour of the beer, replacing the fresh, bright orange scented bitterness of a newly bottled ale with the sweet, complex, darkly fruity flavours of an aged one. The beer goes into the bottle as one thing and emerges after its lengthy hibernation as something completely different – in a fascinating act of alchemy. 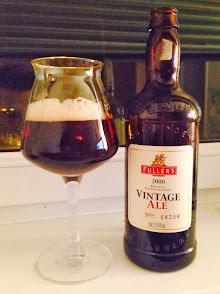 Pouring a deep, dark, garnet red this Fuller’s Vintage Ale 2000 has a surprisingly tight head of off-white foam and a slick, oily body which laces the sides of the glass. Beautiful looking for a beer of any age, but at 14 years in the bottle presentation like this is hugely impressive. A powerful aroma of sweet port, golden rum soaked raisins, and fresh cut oak kicks things off well, with some sweet hot booze jumping out of the glass upon first pouring, but taking a back seat as the beer relaxes. Cellaring a bottle of beer for this length of time has its risks, most notably oxidation (which presents itself as a stale, musty, wet cardboard flavour or aroma), but the ale showed no negative signs of age and was surprisingly vibrant - with no ‘mustiness’ in the aroma at all. The flavour is a combination of sweet port, stewed red fruits, oak tannins, a hint of cherry and faintly spicy black pepper dryness in the finish. Amazingly complex yet surprisingly spritely for its years this is one of the best aged beers I’ve ever tasted. A pleasure to drink from start to finish, the 2000 is a vintage I’ll certainly be looking to pick up more of in the future. Oh and if you've got one in the cupboard, then drink it now, it's perfect!